Enjoy powerful computing with this laptop powered by an 8th Gen Intel® Core™ i7 processor. It features 12GB of memory and a 1TB hard drive that is able to hold plenty of video, files and more. 17.3" FHD (1920 x 1080) touch screen display with IPS technology provides crisp images. Powered by an 8th Gen Intel Core i7 processor. 17.3" FHD (1920 x 1080) touch screen display with IPS technology provides crisp images. LED backlighting provides a thinner, more energy-efficient screen. 12GB of memory is available to run important programs. Memory is not expandable. 1TB hard drive holds your files, videos and photos. Multiformat card reader for file transfers made fast and easy. Features 3 USB 3.1 ports and 1 USB Type-C for ultra-fast data transfers. USB 3.0 is up to 10 times faster than USB 2.0, yet fully compatible with USB 2.0. Built-in webcam and microphones so you can keep in touch with others via video and voice messaging. Features Bluetooth® wireless for fast, short-range data transfers. Use the HDMI™ port to view videos and photos on your HDTV. HDMI cable is sold separately. Provides up to 9 hours of battery life. Battery life will vary depending on the product configuration, product model, applications loaded on the product, power management setting of the product, and the product features used by the customer. As with all batteries, the maximum capacity of this battery will decrease with time and usage. Runs on Windows® 10 Home. Surpass the status-quo on a premium laptop that combines the cutting-edge performance you need; with the high-end design you want. Fearlessly tackle everything that comes your way with next-generation processors, an immersive 8 million pixel display and a daring aluminum design. Keep your momentum going all-day long, with fast boot up and powerhouse speeds. Packed with 12 GB RAM and Quad-Core Intel® Core™ i7 Processor2 3, doing it all is now within reach. Whether you’re watching a movie or editing a video, turn everything on screen into a spectacle with an Full HD2 display, NVIDIA® GeForce® MX150 dedicated graphics card, and audio by Bang & Olufsen. Beautifully crafted with an aluminum chassis, this design is all about high end style. Combine elegance and efficiency with a massive 17” diagonal display, full-size keyboard, and all the ports you need. With HP Dual Speakers, HP Audio Boost, and custom tuning by the experts at Bang & Olufsen, entertainment comes to life with sound you can feel. Awaken your senses with PC audio perfection. When your laptop is low on power, no one has time to wait hours to recharge. Power down your device and go from 0 to 90% charge in approximately 90 minutes. Complete with all the ports necessary for an immersive dual 4K set up, get an expansive entertainment or productivity experience by easily connecting two external 4K displays. Power your device, transfer up to 5Gb/s of data, or connect to an external display all from just one USB-C™ port. And it's reversible, so you never have to worry about plugging in upside down. Easily take this thin and light PC from room to room or on the road. When your PC goes wherever you go, staying productive and entertained has never been easier. The subtle elevation of the keyboard provides a comfortable typing experience and allows air to circulate, keeping your computer cool. 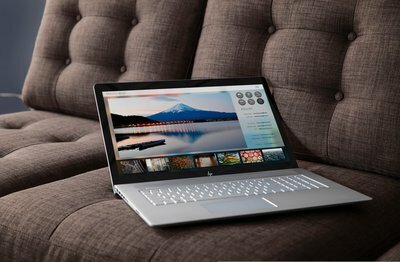 HP devices powered by Windows provide the performance, innovation, and security you need to do great things. Windows Hello* is the fastest, most secure way to sign in to Windows devices, apps and websites** without a password. 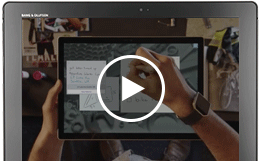 Windows Ink*** is a new set of inking features providing the quickest way to set ideas in motion. Cortana**** is your truly personal digital assistant who becomes more useful every day in helping you get things done. 1 Not all features are available in all editions or versions of Windows. Systems may require upgraded and/or separately purchased hardware, drivers and/or software to take full advantage of Windows functionality. See http://www.microsoft.com. 2 Full high-definition (FHD) content required to view FHD images. 3 Multi-core is designed to improve performance of certain software products. Not all customers or software applications will necessarily benefit from use of this technology. Performance and clock frequency will vary depending on application workload and your hardware and software configurations. Intel’s numbering is not a measurement of higher performance. 4 For storage drives, TB = 1 trillion bytes. Actual formatted capacity is less. Up to 35GB of drive is reserved for system recovery software. 5 Multi-core is designed to improve performance of certain software products. Not all customers or software applications will necessarily benefit from use of this technology. Performance and clock frequency will vary depending on application workload and your hardware and software configurations. Intel’s numbering is not a measurement of higher performance. Intel, Pentium, Intel Core, Celeron, Intel logo and the Intel Inside logo are trademarks of Intel Corporation in the U.S. and other countries. 6 Intel® Turbo Boost performance varies depending on hardware, software and overall system configuration. See http://www.intel.com/technology/turboboost/ for more information. 7 Weight and system dimensions may fluctuate due to configuration and manufacturing variances. 8 NVIDIA, GeForce, Surround, and the NVIDIA logo are trademarks and/or registered trademarks of NVIDIA Corporation in the U.S. and other countries. 9 Features may require software or other 3rd party applications to provide the described functionality. Internet service required and not included. 10 Actual speeds may vary. 11 Wireless access point and Internet service required. Availability of public wireless access points limited. The specifications for the 802.11ac WLAN are draft specifications and are not final. If the final specifications differ from the draft specifications, it may affect the ability of the notebook to communicate with other 802.11ac WLAN devices. 13 ENERGY STAR and the ENERGY STAR mark are registered trademarks owned by the U.S. Environmental Protection Agency. 14 EPEAT® registered where applicable. EPEAT registration varies by country. See www.epeat.net for registration status by country. 15 Internet access required and not included. Availability of public wireless access points limited. 16 Call 1.877.232.8009 or www.hp.com/go/carepack-services for more information on Care Packs available after 90 days. * Windows Hello requires specialized hardware, including fingerprint reader, illuminated IR sensor or other biometric sensors. ** Limited to compatible websites and apps. *** Touch capable tablet or PC required. Pen accessory may be sold separately. **** Cortana available in select markets; experience may vary by region and device.